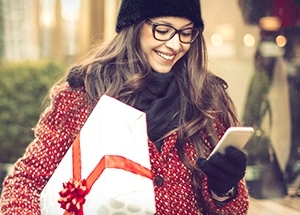 Holiday shopping can be one of the most stressful activities of your calendar year. While everyone loves the holidays, the build up to whichever winter holiday you celebrate can be exhausting! You have been scouring to worlds end for the best deals and the right model or design of whatever you are looking to purchase. The point being that the holidays can be stressful! Did you know, though, that there are measures you can take to alleviate some of that stress during the shopping season? In the below blog post, we have outlined some different ways for you to help remove some of the stress of the holiday shopping! Best of luck this shopping season! We have all seen the horror images of people crowding into stores for Black Friday deals and specials. Who wants to be a part of that? That’s what I thought. When you can, stick to shopping online and finding deals that will best suit your budget. There are so many top-notch e-commerce sites available now-a-days, where you can buy almost anything! Take advantage of that. While it might seem tedious, putting together an organized list will help you remember who you still need to buy for and what you have already bought. How many times have you run through a list, in your head, of relatives and friends who you need to buy for this holiday season? I know I’ve done that. Make your list and don’t think twice! This will help remove a little pressure from your mind this year. Many of us have all done this. It’s a day or two before Christmas and you have two or three more gifts to buy for family or friends. That can generate a great deal of stress! By this point, you are blindly perusing stores to find those last few items to round of your shopping list. Don’t let it get to that point! Get your shopping done early and allow yourself to enjoy the holiday festivities. We hope you have found this tips to be useful as you complete your holiday shopping this year! Do your best to get your difficult holiday shopping done early so you can spend the holiday season the way it is meant to be spent; with your friends and loved ones. From all of us at Worth Ave. Group, we wish you and yours and a happy and safe holiday season!